There are literally hundreds of options when looking at car rental in Rhodes Greece. It is a common way to get around the island and is the first choice for millions of holiday makers every year. Which one do you choose though? Many people are caught out by extra charges they were not ready for as well as other issues. Are you going to be one of them? Here I will talk to you about renting a car in Rhodes and what to look out for during your visit. First off, ‘Can I not bring my own car‘? I hear you cry 🙂 Well, you can, but to be honest it is not worth it and you will find it lot more of a headache (and more expensive) than simply rent one during your stay here. Most of the car rental businesses here are eager to rent you a car and the prices can vary from company to company. You can make arrangements for the car to be ready for you and waiting at the airport for your arrival, or you can settle in first and have one delivered to your hotel (or wherever you are staying). Of course, you will find all the big names here when it comes to car rental. Avis, Hertz, Budget and Enterprise are all big players here but that is not to say you cannot find great deals in other places too. Rodos Cars is another great and reliable company and the service you get is also with that personal touch which you do not always receive with the big car rental agencies. There are also other reputable companies which offers great service and prices. To be honest the list goes on as there are hundreds of rent a car offices around the island. The only thing I want to make you aware of is the issues with insurance. The problems people have with insurance is common when it comes to renting a car here. Some companies have promises they do not always keep and when it comes to you needing assistance and they do not always stand by you. Some standalone family businesses can be like this. The big company’s I mentioned above are actually sound when it comes to insurance, Rodos Cars being the best by far in my opinion! The smaller companies can not be so secure though, and if something happens you can find yourself being asked to pay lots of money! delivery at the specified time of arrival. This is common for people who want to have the car for the full duration of their holiday as they can also return the car back to the same place at the end of their stay! It also alleviates the issues of getting around with all their bags once they get here and after a long journey. Other people prefer to take the buses provided with their holiday package straight to their hotels as they may not want to drive straight away after coming off the aircraft or boat. This way, they get transferred to their hotel or place of residence and if they choose to rent a car later it can be delivered to them without a problem. You will find that in most of the big hotels on the island there will be a rent a car desk and a representative from one of the car rental companies on the island. For example, if you are staying in an Atlantica hotel, you will be greeted by someone from Rodos Cars in the reception should you want information! Budget also have offices in different hotels as also do Hertz and Avis! When it comes to choosing a company to Rent A Car with, it comes down to your own approach and feelings on it. It is not for anyone to say one is better than the other in this case as even the best companies in the world can have an unsatisfied customer. 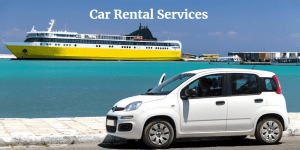 Personally I have rented cars here on the island from Avis and Rodos Cars and the service was excellent, although I will admit Rodos Cars was better priced and all the insurance was included. With Avis, I had to pay extra! I also have a lot of friends that work in the different Rent A Car companies here and to be honest I do not hear so many bad things when it comes to their service. If you choose a bigger company with a name yes, you will pay a little more, but trust me it is worth it if anything happens. The smaller companies will not offer you the protection the bigger ones will! That is my opinion anyway! To rent a car in Rhodes you need to meet the following criteria. These vary from company to company but you can use these as a general guideline! An International Driving License if you are not an EU driving license holder! You must have been driving more than 1 year! It is important to note the age restrictions. There are a lot of younger people, for example 18 years old, that go around asking for the latest cabriolet sports cars or huge soft top jeeps. The companies here on the island simply will not do it for someone so young, especially when the cars are from the more expensive range. As I said above, the minimum age of the driver needs to be 25 and over for these categories! One of the common problems here is the fact that some people lose their sense of responsibility due to them being on holiday. They will sometimes do things that they normally would not do if they were back home. Drinking and driving is one of them! Yes I know, holidays are holidays, we all want to have a beer or a glass of wine with our meal or have a night out. A word of warning though, if you have an accident and you have been drinking the Greek Police will not tolerate it in any way! Many accidents have occurred in the past and you really do not want to be one of these statistics. And let’s not forget, no matter how good you think your insurance is, it will not cover you if you have been drinking, so think ahead! If you are planning a night out, consider using the bus service or a taxi instead! Do not risk drinking alcohol and driving a car. One of the most common questions people ask before renting a car is with reference to the Greek drivers! Well what can I say? Good or Bad? They can seem to drive a little on the fast side, and they do seem easily distracted! It is not uncommon to see them chatting away on their mobile phones oblivious to what is going on around them! The only thing I will say is, let them get on with it. You follow the rules, take your time and do not race. You will never change the way people drive, not in Greece or anywhere else, so you just do your own thing and be safe! For sure there are no reasons here for it to scare you out of renting a car to see the island. Renting a car really is the best way to see the island. You can move around in your own time, see what you want to see and when you want to see it. You are not tied to someone else’s timetable and you can come and go as you please. If you were to ask me the best way to get around Rhodes, this is definitely the way! 99% of the island is safe to drive around and the road signs are in both Greek and English. The island is easy to navigate and the coastal road runs all the way around. If you get lost (which you won’t) look for the sea and you are back on the coastal road! Easy!! 🙂 Only a small number of roads to the south of the island can become a problem inland as they lose the asphalt in places. Other than that you will be fine! Overall if you rent a car during your stay here you will not be disappointed and you will open the door to see as much as possible! This covers the car rental section, and you should be able to move forward knowing what to look out for. Leave me a comment too if you have something to share! I always like hearing from you all! Thanks for this informative article about car rental in Rhodes Greece as well as promoting how beautiful and safe Rhodes is! whatever your purposes of visiting, whether for leisure or for business you will definitely enjoy. 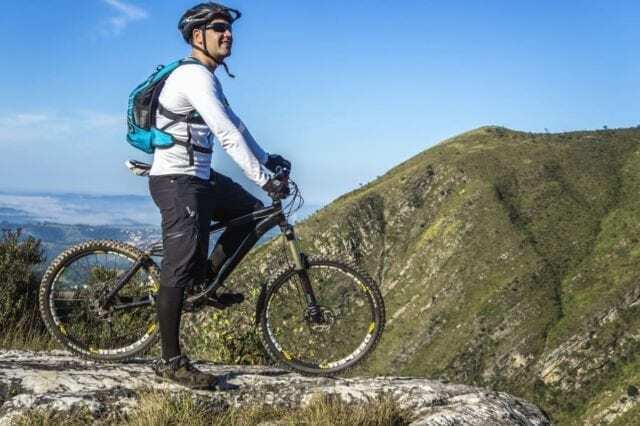 This article really provides a traveler the guidelines as to what better option to take, and also I really appreciate for reminding us what should be avoided and how to find our way back when we get lost somehow. Thank you Glenda. It is great you found the information here useful and helpful. Hi Chris, what a fantastic and informative site, thank you so much. Rhodes has not been on my bucket list but I think it might be now. The Greek Islands are so beautiful with all the blue Mediterranean seas surrounding them. It is always a concern for travelers when hiring anything (be it a car or motorcycle), as there can be hidden costs which you are not told at the time of hiring. The worst thing is, at the end of the holiday, you may be hit with extras! It does leave a sour taste, where a holiday has been great then at the last, thoughts of have I been had? Knowledge is so important, thank you once again. Yeah you are right Michele. The problem is, a lot of the time people are on holiday here in Rhodes, and their guard is down and they are here to have fun. Very often they will take on board what is told to them and they have little in the way of questions. It is always good to be thorough, and avoid that sour taste later on. There are some good companies here however, so there will be no issue with you finding a great deal for a rental car. Thanks Michele, nice to hear from you. I totally agree on not bringing my own car. Far way expensive. Although I have not visited Greece yet, I can totally relate. In my area, Hertz are the most picked among many, but not every place is similar in prices for rentals. Locally owned rentals are truly cheaper as long as we don’t get into accidents. It is so good to put the word out there and help many visitors. Yeah sometimes with the smaller owned car rental companies they can offer a cheaper rate. It is always good to check the insurance though so there are no unwanted surprises should you have an accident on the road. For this reason (I personally) choose to select companies with a good history, even if it means paying a little more. People always want a bargain and/or a better price, but it is not worth it if you end up paying a heavy fee later on because you did not get a good package. 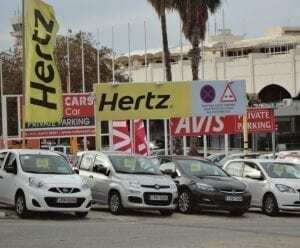 We also have Hertz here in Rhodes, as well as the other big players in the rent a car business. They are a little more expensive, but you get what you pay for. Thanks, nice to talk to you. Going to Greece is a dream of mine *sigh*. I would be nervous to drive there though! I just am nervous at the thought of driving in another country all together (I’m American). I am sure I would annoy everyone else on the road. Don’t worry, driving here is actually quite OK. You do not need to panic or stay rooted to one place. Getting around by car is a great way to see the island. Many people are afraid of driving in a new place or in a completely new country, but if you keep calm and do not rush, everything will be fine. Wow! This website had so much information! I had no idea that all the big name rental companies were abroad. I’m not sure why that surprised me but it did. I do have one question…how do you get an EU drivers license? Also, do you have to have had it also for a year? Hi Kara, to obtain an international drivers licence I would suggest you contact your driving licence authority in your home country and they will be able to advise you. The international drivers licence is issued for a period of one year. It is usually given to you in order to travel to countries that require it, so this is not something you need to have 1 year in advance. This is a great post. I have never rented a car but I might start with my visit to Rhodes next June. I am not that good a driver though, as I am only 21 and quite new on the road. I found your article very helpful and look forward to renting one soon especially in Rhodes. Hey Riza, yes age and experience is something you need to be aware of when trying to rent a car in Rhodes. All of them have rules when it comes to age and how long you have held a license. Some companies require you to be 22 years old and driving for more than 1 year. You will find variations on this, but this is a general rule of thumb. Let me know when you are making your final plans to visit, and I will be happy to help you dig out the best deal. It seems too me like Rodos Cars Rental is the way to go. Not too big and you get the personal touch with decent insurance and assistance. Can you tell me what is the driving speed limit for Rhodes? Do you drive on the left or right side of the road? Thanks again for a very helpful and informative post! Yes for sure Rodos Cars is a good choice, but you will always have people that are loyal to what they know. In all honest, most of the big names here do offer good service, and Rodos Cars is up there with the best of them on the island. In answer to your questions, we drive on the right side of the road here in Rhodes, and the speed limits are as follows. In the city and in the villages the speed limit is 50 km per hour. On the open roads, the speed limit is 80 km per hour, and certain areas are 60 km per hour. They are all clearly marked. Glad you enjoyed the information here, if you need anything more let me know. Thank you for a wonderful review, Chris! I love Rhodes but I have not been there for over 20 years so I expect it’s changed quite a bit since my last visit. That said, we will be taking our next summer holiday in Rhodes and I will rent a hire car for the family. I normally rent from Hertz or Avis, as I assumed the big companies offer a less risky insurance package and more reliable cars. I hadn’t given the smaller local companies a thought but it does sound a though this might be an option to look at them again. Is it normal to expect to pay a premium for car collection and return at the airport as opposed to local collection? In all honesty I have never heard of any rental car company charging for collection or delivery at the airport at all. I know many people that work in the rent a car business here and I have also worked among some of them here on the island, and I have never once heard of someone being charged for this. This is something to be on the lookout for without a doubt, and if you are challenged for this payment, I would question it. Thanks for your question. I hope I have been some help. Hello, This is some really great info. 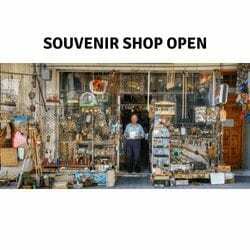 I’ve never been to Rhodes, Can you tell me a little about it? Like what is there to do or see? I love to travel. The things you are looking for are right here on this sit (and there is a lot more coming). If you go through on the Start Your Tour Here link, this will take you to the beginning. At the bottom of each page you will also see links to relevant areas of interest. Here you can take a look at how to get around, see some history, check out Lindos and The Medieval City. Rhodes Town is also another great place to look into. Just feel free to browse around and see what is on offer. Of course, give me a shout if you need anything along the way. Hi Chris what a fantastic piece of information. We love holidaying in Greece and Rhodes is one of our favourites. However we always find the whole renting a car thing a bit of a headache and I will not drive over there as I feel that the drivers are so aggressive. My husband drives for a living so he copes with it fine. Now that we know about your site we will be using it on a regular basis. If you had to recommend one specifically which one would it be? Hey Emma, great to hear from you. I hope you are visiting Rhodes again soon. I know what you mean when it comes to driving. Sometimes, if you are not used to it, or you are in a foreign place, not all people are comfortable to get behind the wheel. The best advice for this, is to simply take your time. Let the others be aggressive. I treat them all with the contempt they deserve, and I ignore them. In my opinion, I have to offer Rodos Cars Rent A Car as a first choice. I have used many services, but these guys always seem to offer me the best deal and I have never once had an issue. Let me know when you are coming back! I have traveled to a few countries, and this information would have helped for these other countries too. I knew nothing about hire cars in terms of insurance, and international licences. I will certainly keep your website in mind when I travel to Greece. Your comment about drivers in Greece made me laugh. ​European drivers are more daring than some. My mother is from Spain, and when I visited Spain, Barcelona – I couldn’t believe how the traffic seemed to flow in what seemed a chaotic manner, however there were no accidents. My mother does not drive, driving lessons didn’t go well when she was younger. Ha ha ha. When you travel to a country it is so important if you can receive first hand information, from someone who knows the drill. And when you hire a car, it’s not something that many people have much knowledge about. So you just guess the process. You’ve left the guess work out. And should we travel Greece, we will definitely be looking up your website. Thank you for sharing your expertise and such valuable information! Thank you very much for your comment Shelley Ann. There are some countries where the driving and the system on the roads seems chaotic. Although I have never personally driven in Spain, I have taken my chances in Rome and Amsterdam. These were quite challenging, but finally everything went well and I came away without any scars. It is important to travel to a place equipped with the information you need to have a stress free time while renting a car. I am happy you found the information here complete and you got what you needed. Thanks Shelley Ann, great to hear from you. When my friends and I travel we always chip in on a rented vehicle and take turns driving. And yes I agree having your own rented vehicle is totally better then having to wait for the cab or a tour bus. It’s like you said we live on their timeline and not ours if we always take the bus. I agree with you on the insurance tricksters. The big companies are the best when it comes to insurance. They can actually afford their liabilities vs. small companies that rarely feel obligated. Yes, doing things to your own schedule and time frame is a far better method as far as I am concerned. There is nothing worse than to have to cut a day out short to satisfy someone else’s timetable. It is always important to ask about the insurance, even if you think you already know. Having all the information upfront is better than having surprises later if something happens. Thank you Vicki, it is great to know that my information is useful. Renting a car and getting around is a great way to see all of the places of interest. I always prefer to rent a car when on holiday. It just makes more sense and having your own transport means you can do things spontaneously, just explore, and have fun without worrying about buses or schedules. I have heard that Greece is the perfect place to explore on a motorbike, though. Do these places also rent motorbikes, or is that a totally different area? Yes, you can get around Rhodes with any form of transport you wish, although I would say a car is a safer option on the roads here. There are outlets for renting scooters, motorcycles and quad bikes (ATV). You can find them on the link here. Thanks and let me know if you need something more. I have rented a few cars from enterprise here in the USA, but I have never been out of the country to where I had to rent a car. I have been to Canada and Mexico, but I never drove in either of them. I found this very interesting to read because I remember being fascinated by how they drove in Mexico City. If I ever end up in Rhodes Greece I will be well informed. I have always wanted to visit Greece so maybe I will make it someday. It is always good to be informed when it comes to renting a car, so I am happy you found the information here useful. People often think of renting a car when the go on vacation and are flying to their destinations. However, it can make sense to rent a car for a road trip. It puts the mileage on another vehicle, and you have the added protection of the car rental company helping you out if you were to break down. Yeah these are good points, but I want to let you know a couple of things when it comes to renting a car in Rhodes. First of all, because Rhodes is a small Mediterranean Island, the only way to get here with a car is by boat. This can be quite pricey. Also, if you rent a car in Rhodes, a lot of them tell you that you are not allowed to leave the island with the car. This is for insurance purposes. Most of the time, if people come to Rhodes it is because they want a holiday in Rhodes. The chances of the wanting to make a tour off the island (i.e a road trip) is small. Certainly visiting Rhodes is made far easier by traveling here with the plane. Most people do this. There are boats/cruise ships that come and go but only a few local Greek people will bring their cars across from the mainland. As a rule, it is better to take a rental car during your stay in Rhodes. Naturally, your point stands if you have a breakdown. Most of the companies offer a breakdown service should you need it. Thanks Kit, I appreciate you getting in touch and thanks for your comment. For someone who loves to travel this is a solid guide. Its good to know what you’re getting into before renting a car. Knowing that a small family-owned business could potentially fall through on their promises when it comes to support and insurance is crucial information to have when making a decision. From your recommendation it sounds like Rodos cars is a safe bet, I’ll absolutely check them out if I make my way out there! Hello there and welcome, it is great to have you here. Yes, Rodos Cars is a very safe choice when it comes to choosing a rental car service here. I have also used them and have never had any issues at all. It is always good to acquire important information before renting a car, and I am glad you found my post helpful. Thanks, and let me know if you ever need anything prior to a visit to Rhodes. As much I would like to…. alas so often the answer is no and I should just expect to rent a car when I get to my holiday destination instead. What is your worst fear when it comes to a rental car on holidays? Hey Glenys, great to have you here. To be honest, renting a car once arriving in Rhodes is far better than trying to get here with your own transport, and it is a lot cheaper too. 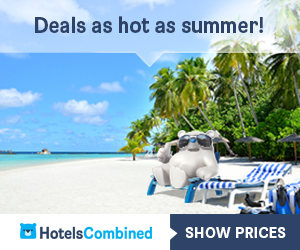 Booking ahead is also a great idea especially if you are visiting in the high season when it is very buy. it is always better to pre-plan rather than get here to find everything fully booked. As for fears, I do not have any in all honesty. The process here for renting a car is very straight forward, even if you do it online. Just be sure to check the insurance details. Apart from this you will be just fine. Thanks Glenys. Let me know if you need something else. The whole family is planning a trip to Greece next May, and we didn’t know where to go exactly. We thought of going to Crete, but when we saw your website, we finally decided to opt for Rhodes. Thank you for all the details about rental cars. It will come in handy once we get there. How is the traffic in Rhodes? Are there hours we should avoid? If you come in May time having a rental car is a great choice to see the island. Thanks for reading, and I am happy my information here led you from choosing Rhodes over Crete! Thanks, and let me know if you need any more details prior to you getting here. Hi Chris! It’s very cool that you live on the island of Rhodes. There’s a very colorful history it seems. 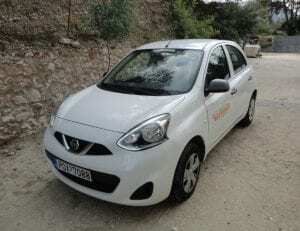 Regarding rental cars in Greece, it sounds almost typical of renting a car anywhere else, but why do you think it’s more of a pain to bring your own car? What obstacles make it so much of a pain? I’d love to visit the island one day. That’s a bucket list item for me. Well Tiffany, it is very expensive to bring your own car here on the island for the following reasons. Fuel: It is quite expensive to drive all the way from your home country, across Europe to get to the locations to take the ferry boat to Rhodes. 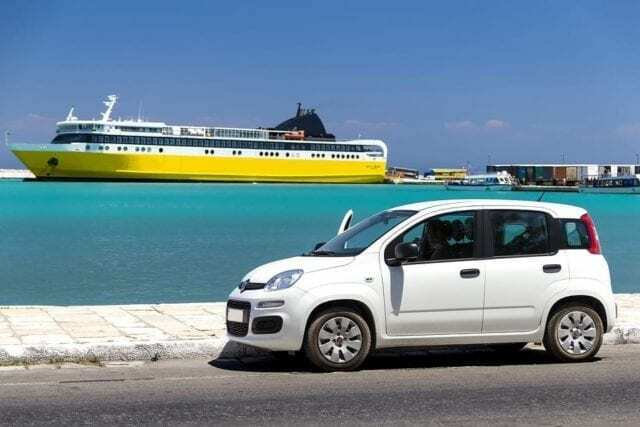 Boat: As the island of Rhodes is a small island in the Mediterranean, the only access with a car is with boat, which again can take a nice sum of money from your pocket. Insurance: Bringing your own car usually needs you to contact your insurance company and arrange extra insurance out of your home country. There are of course numerous scenarios to consider, but overall, you will find it so much cheaper simply renting a car here on the island. I hope this helps you.If you need more just let me know! I really enjoy learning about vacation destinations around the world. 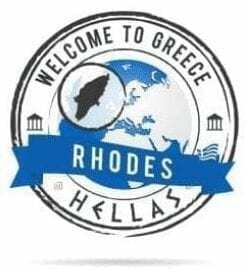 I am creating a list with my wife and hopefully we’ll have a chance to go to Rhodes some day! I had the same question as another reader about the international license, but after reading through the comments I feel more comfortable getting that figured out. What is the best time of year to visit? I prefer to look at times that are less busy but still nice weather. Hi TJ, happy to know you found the answers you were looking for here when it comes to renting a car. If you check out my section on The Climate Of Rhodes, it offers lots of information about the best times to visit while bearing the weather in mind. Again in the comments, plenty of people have had the same questions. If you need more let me know! I really liked the article! I had no idea there was so much to write about for renting a car on Rhodes Island! I really don’t think I have any questions after reading this! I can tell you, once I start traveling the world and make a trip to the Island of Rhodes this is where I’ll be coming to scope things out! Hi Chris and thanks so much for reading. I am happy I covered all the bases for you here. If you do find you need further information on anything, feel free to give me a shout. I have been to Rhodes before and want to visit again. Last time I went, I could not rent a car, since I was only 19 years old and just had my driving license for a few months. Next time I will visit there, I definitely will rent one. It’s just so much nicer to actually have the freedom to drive to any place you whenever you want to. Hey Phil I know what you mean when you talk about those crazy people on 2 wheels. The scooter drivers here are not overly cautious either, so it is always good to be on the lookout and have your wits about you. A car is a better option and it is safer. At least during your next visit you will be eligible to rent one, so you will have a better time with more freedom to go when and where you want. At least this way you will be able to see all of the island and its attractions at your leisure. Looking forward to seeing you back here Phil. It’s really great. When I saw your section on the butterfly valley in another post, I already had a question in my mind. Can I rent a car there? If you travel in Hong Kong, there is no need to rent a car because Hong Kong is too small and the transportation is very good. If I go to the USA, I must rent a car. If you have no car, it would be very inconvenience. I think this situation is ther same as Rhodes/Greece? So, you have provided me a lot of useful information. The most important is the criteria when I want to rent a car and some information of the driving environment. Thank you so much. If I go to Rhodfdes in the future, I will think of you. Thanks CT. It is nice to learn you also have your thoughts on the butterfly valley here in Rhodes too. In answer to your question, I am not aware of a car rental office or service actually at the butterfly valley. This is because 99% of the people that visit this location have already fixed their methods of transport for the holiday duration. It is a tourist attraction for people to come and appreciate, and not really somewhere you visit with plans to find transport somewhere else. If you want to rent a car during your stay, you are better booking online before your arrival. This way the car can be picked up at the airport on your arrival (or your hotel). The driving here is actually very easy, but like when driving anywhere new, just take your time. 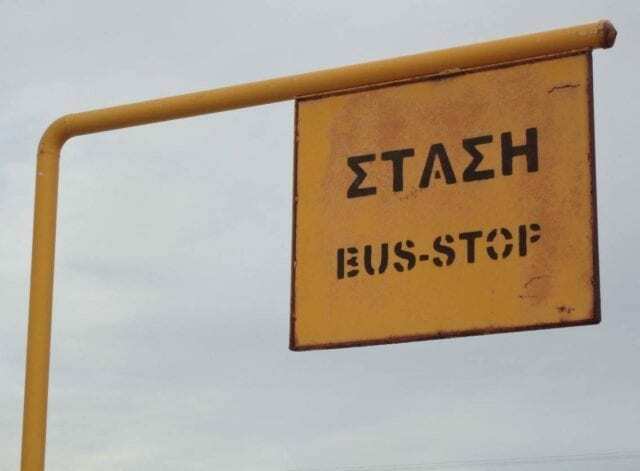 All the signs on the road are in English too, so you will not have any problems trying to decipher the Greek language whilst on the road. I’m planning a trip to Greece very soon, so this info comes with perfect timing. I know many countries have aggressive drivers, so I’m not worried about that. I just want to choose the right company and plan my vacation the right way, so it’s less stressful when I arrive. It’s nice to know that I can choose from smaller good rep companies. It is like most things in life, you get what you pay for. 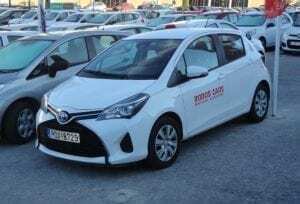 Many people do not mind to use the smaller local companies on the island of Rhodes to take their rental car, others prefer the peace of mind and insurance from the more reputable companies. Each to their own in all honesty. There are some good outlets here, and whether you wait to arrive on the island to fix your transport, or you book online, you can usually find a good deal. In July and August though, just take care, as it does get very busy and availability can be stretched. Sometimes during these periods, it is better to book online prior to your arrival. Thanks, and let me know if you need anything before you start your journey. I have to say I love reading your posts surrounding Rhodes. This does seem like a truly wonderful place. Okay so now you have brought us some very valuable information regarding car rentals for our stay on Rhodes. I know you mentioned some smaller companies such as Rodos Cars. Them seem to be pretty good but with the insurance issue that may be a problem and I may be reluctant. I would be reading all the details first. I thought you also brought a very interesting point when it comes to the age restrictions. I know here is the US it seems our laws would be much different. Thank you so much for providing this great information. 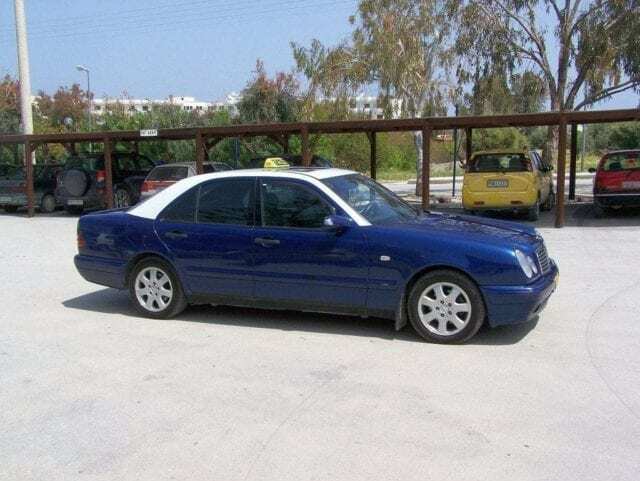 Hey Melissa, when it comes to renting a car in Rhodes, you will most likely find Rodos Cars to be one of the best. Yes, there are the bigger well known world wide companies, but actually on the island of Rhodes, Rodos Cars is the biggest. As for the insurance, what they tell you is what you pay. No hidden extras. This is unlike the bigger companies. Age restrictions here are important and rental companies will not make an agreement with you for a car if you are underage, or have been driving for less that one year. It is simply the rules, and it is good for people to know before they come. Thanks Melissa. Happy you liked the information! Hahaha…. it’s great to be back phonetically. I have visited your site several times and and I really do enjoy it. Now,the issue of cars here. I would also crave to bring mine along but from your advice I would rather go by it. The island of Rhodes remains the best place to be. I will admit, a lot of people do consider bringing their own car to the island for their vacations. Trust me though, it is not worth it. The expenses that you would incur would be way too much, and a lot more than what you would pay if you simply rented one for a few days. The services here for rental cars are pretty good to be honest and most of them offer good insurance terms too. It is like everything else though, just shop around to get the best deal. A lot of people do it online to be honest before they get here. Nice to see you again, have a great day! Hi Chris, I am back to reading this article again as I am really trying to plan my trip to Greece FINALLY. I needed to see which cars were more reliable as far as getting the insurance and being covered. I think I will stick with your recommendation on the Rodos rental cars. Getting an international drivers license was actually much simpler than I thought. Hey there, great to learn you sorted out the international drivers license. It is not as complicated as some people think is it? Great to know its sorted. As for the choice of rental car companies, Rodos Cars is pretty solid yes. A lot of people prefer brand and known names such as Avis, Herts, Enterprise etc, but I will be honest and say Rodos Cars are well up there, and they compete with these big names quite easily on the island. The choice is still yours though of course 🙂 But I am here to help with this too if you need! Hi, I liked your review. It does seem that renting a car is the better option. I like the idea of being free to come and go. Lots of great tips on what to look out for. I guess forewarned and being prepared is always an advantage. Looks like a great place too. You must have a great life there! Hello there and thanks for your comment and thoughts. To be honest, I will never say one choice of transport is better than the other, but naturally people look for the best price. In my opinion, for the price, a rental car would be the best way to see the island with minimum stress. Other people will see it differently. I know a lot of people prefer to travel by bus or taxi as they do not want the stress of driving. The only problem there, is you can pay quite a lot for a taxi, and the buses can take a long time to get you to your destination. Like you say, with a car, you can make your own plans with your own time schedule. Rhodes is a great place to live, and I love it here. It is also a wonderful place to visit and see. Let’s hope the information here helps a lot of people with their decision making when it comes to getting around the island. I’m from Greece although I’ve never been to Rhodes before. The truth is that renting a car is way cheaper than bringing your own if money is a concern for you of course. However, Greeks do not just drive on the faster side of things but our driving habits are far worse than that. Beware of the Greeks! 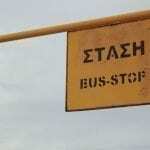 Yes, the Greek drivers can be sometimes erratic and a lot of them do not seem to concentrate on the road too much. You see a lot of them driving while using their cellphones and generally doing everything apart from watching where they are going. This, mixed with people here on holiday that are not always familiar with the area, can lead to accidents. This is why I always advise people to go slowly and take their time. It is worth it in the end. Thanks John, and get over here. Will buy you a beer! I just visited your site and I like the idea about car rental…its a great one since everyone cannot afford to take their’s, but at least you offered them an alternative. IAnytime I come visiting I now have an idea of where to get a rental car. To be honest Car Rental is a popular way to see the island. It is not the only way of course. Their are buses and taxi’s as well as other options. You can see more on Getting Around Rhodes here. I will be honest with you and say, that it is not practical to bring your own car here for vacations, especially if you are travelling from a long distance. It can be very expensive, tiring and it needs a lot of planning – not to mention the paperwork and the insurance. I have not known anyone come here by car, unless they are more local. For example from Athens you can bring your car across by boat and a lot of the Greek people do this, but it is not so much a common thing with summer tourists. It far more economical to Rent A Car here. The prices are very competitive and you would find it much easier. I am planning a vacation in Greece next September and found your article very useful, as my intention is to rent a car. Getting some experienced tips on which rental to use is very useful. I liked your approach for the article as you do not know the value of your insurance until you need it. So thanks for sharing your view. Good call on taking responsibility while driving even when on vacation. Hey Jose, you are welcome, and happy you found the information here useful. All companies are different to be honest, and while some of the bigger companies follow the international rules (Avis, Hertz, Budget, Enterprise etc) some of the local companies in Rhodes are very good too. Where in Greece will you be visiting? Let me know and if you need some information ahead of your visit I will be happy to help you out! It’s good to know the options you have for car rentals. I am a little travel challenged but if I were to ever travel to Greece I do have a question. I love to ride motorcycles. I was wondering if there were any companies that do motorcycle rentals? I think it would be a great way see all of what Rhodes has to offer. The coastal roads you mention seem like they would be especially nice to ride. 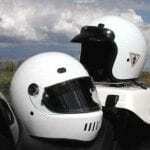 There are indeed options for motorcycle and scooter hire and you will find a lot of information on it on my motorcycle hire in Rhodes page. There are many options for getting around. You can even choose to take a car for a day or two, then change to a motorcycle if you prefer. There are also plenty of taxis and buses to aid you to get you where you want to go. If you need more just let me know! Thank you so much for the great informative article! I’m looking to visit Turkey soon and then I want to travel to Greece and Rhodes, it is definitely one of the places I want to visit! Thanks again for your very informative site. Emrah, thanks so much for reading and for your question. Greece has the standard European rules on the road and yes, the driving controls are on the left side of the car. Opposite to the UK 🙂 Are you from the UK? I know for a fact that people do visit here from countries with a different setup. I myself am from the UK originally and I learned to drive on the left side of the road with the controls on the right side of the car. When I first took charge of a car abroad, I was actually OK with it, but I know some are not. Once you get used to it, then you will have no problems at all. It is more of a comfort thing to be honest. You reminded me actually of when I went back to the UK 3 or 4 years ago for a visit. I rented a car from Manchester Airport, and that was the first time I had driven in the UK for many years 🙂 It was not the best experience lol. I also love the images at the bottom of your pages, I would love to incorporate that into my website. I’m a huge history buff, so having the history with the travel, HOW GREAT!! I would have never thought to do that. Defiantly book marking your site. Hi Erin thanks so much for book marking my site. You have your own website too? That’s great. What are you doing there exactly? I would love to know. If you want get in touch with me from the contact form and I will have a look. Maybe I can offer you some pointers when it comes to the imaging. Would be my pleasure to help you out! Thanks Erin, hope to speak to you soon! We booked a last minute break during Easter and it was one of the best holidays, we found that car hire is great, getting around is incredibly easy, our small villa was comfortable with a private pool, the locals were all so friendly wherever we visited. Hi June and thanks so much for your nice comment. It is great to know you have visited this wonderful island and that you had a great time too! The last minute breaks are very common here especially approaching the Easter period. This year things are getting started earlier, and around the Easter time and before, we are expecting a massive influx of people for their holidays! Where did you stay? Sometimes it is nice to be away from the tourist path and it can lead you to see the island in its true form. Some of these small Greek Villas are perfect for this, and I can understand it too, not everyone likes the thought of staying in a huge 5 star hotel. The small family run businesses can offer you that personal touch too. What do you think? It is a common thing for people to choose the big names when it comes to car rental. I think for the peace of mind that they have protection in a foreign country is important to a lot of people. On saying that there are some really great reputable companies on the island too, so while the big names are good, it is worth knowing there are other good value options too. What a beautiful website and great information, Chris! I always wanted to explore all European countries, and Greece is on my to-do list as well. 2) Is it worth renting a car? How much more expensive would taking a taxi be if I don’t choose to rent a car? Looking forward to hearing your questions soon! Before i do though, make sure Greece stays on your list of places to visit. Athens is very beautiful, but to be honest the island of sun is far much more exhilarating 🙂 You will love it here! Being from Canada, ideally you need an international drivers license yes. I know some companies will overlook it but if you have problems with the police it is better for you to be holding it! If you ask at your countries Driving License Agency they should be able to inform you of how to go about acquiring one! For sure it is worth renting a car for the value. If you look at my page here with information on the use of taxis you can compare the both. In my opinion renting a car is far cheaper and more enjoyable. Also there are many car rental companies here that offer a wide array of models including automatic transmission cars. For the automatic cars sometimes you pay a little more (for some reason) but it is great for those people who cannot drive a manual/shift car. Hi Chris, thank you for the well written and thorough article. I find myself in Northern Italy frequently for business trips but have not made the trip South and East to Greece. This article would certainly give me the confidence to rent in Greece (something I probably would not have done before given the reputation of driving there). Can you tell me specifically, what is the (refundable) down payment required for someone from the U.S.? This varies so much for different places in Europe it is good to know ahead of time… In Germany it’s $0, in Italy it’s over $500; any idea of what it is in Rhodes? Hi Andy thanks for your query! If you do find yourself here in Greece in the future then you will love it for sure. Renting a car is the best way and most convenient to see the island and with regards to your question it depends on the company you use. The bigger names such as Avis, Budget and Hertz etc do have a down payment and they will block the amount from your credit card. They will not take the money, but just reserve it! When you finish they will then release the block and the money will be available to you again in 3 or 4 days! Personally I do not agree with this and it is difficult for people to have all this money blocked when they are on holiday. It can be a lot of money like you say. 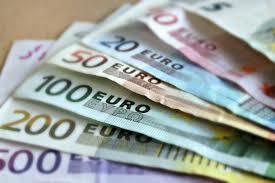 From 500 to 1000 Euros depending on the car you choose! I know for sure that Rodos Cars and George rental cars do not do this. The down payment is zero, but this of course changes if you take the expensive sports cars and cabriolets. Hope this helps, let me know if you need something more! The timing of your article couldn’t be better! I’m planning on a family holiday to Europe and, in particular, the Balkan region. I’m always on the lookout for good value and so when I read what you wrote about Rodos Cars, I was really impressed. You clearly put a lot of thought and research into this article, which translates well to the reader. When are you planning your vacation out of interest? Greece has always been on my bucket list. Seems like a wonderful place to visit full of history and beauty. I am just curious how you get an international drivers license? I am not familiar with that at all. So, it is best to go with a more well known rental car company and get the insurance? I also forgot this because my own covers it, opposite of what the agent will tell you. Rhodes is indeed a wonderful place and it is a location everyone should see in their life 🙂 You will not regret it if you come! With regards to the international drivers license I am aware that your holiday agent can offer information with respect to this. I am sure the rules are different depending on the country, but I do not think it is something that needs to be a struggle. There are also driving license agencies which are responsible for all the documents, for example the UK has the DVLA!, Maybe there is something similar in other countries? Although you have your own insurance, (a lot of people do actually with their credit cards), be aware that the car rental company will still charge you any liable funds. Then you need to go back home and start the process of claiming the money back from your own insurance! Sometimes it is better just to pay the extra insurance here to avoid all the paper chase later on! There are companies here though which offer the FULL insurance with zero liability. This is the best option for sure!